There has been a lot of talk about savings and rebalancing. I’m not going to touch this stuff in much detail until the Savings Working Group releases their final report. But in any case, I do need to say a little something now. I didn’t like the interim report from the savings group (but remain hopefully the final report will provide a more reasonable break down of events when describing any policy conclusions. And as a result was worried to hear that the government said it would be changing policy on the basis of the interim report. However, most of the changes they are discussing are more than reasonable – so that is good. People borrowed heavily to buy houses and farms, property prices soared and New Zealanders felt wealthier as a result. 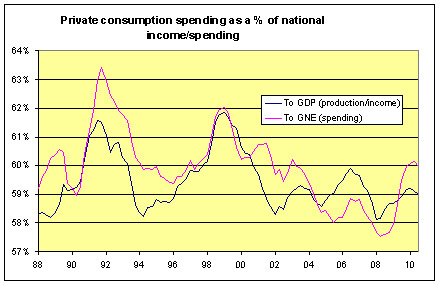 They spent a lot on consumer goods, which led to a bubble of economic activity. Really? I mean, GDP tells us how much stuff we can make – apart from any loss resulting from wasted investment, and changes in relative prices, when we have a certain level of “GDP” we should be able to return to it. It is production. Did our spending relative to the amount we could produce seem excessive relative to the last 20 years? Now, I recognise that the concern could be more long term – we could have been seen to be borrowing too much to consume for 20, 30, 40 years. But without an actual strong reason why this is the case, and why our creditors have allowed it to persist for so long, I find this difficult. A country CAN run persist current account deficits, a country CAN hold a large stock of debt as long as it can meet interest repayments. We can’t say that this is a problem unless we can describe specific institutional factors. And I haven’t seen anyone do that. The interim report most definitely didn’t, although I am looking forward to the final report because I am sure it will go into more detail explaining “why” – which is something I would like to know about before commenting on any policy recommendations.